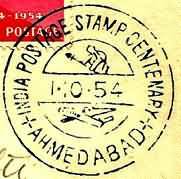 India Post celebrated the centenary of the India postage stamps on a grand scale all over the country. 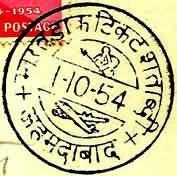 A set of 4 stamps in the denomiation of 1 , 2 , 4 and 14 annas commemorating the event were issued on October 1, 1954. 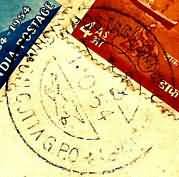 Also issued on this day was a set of 7 commeorative postal stationery items – 9 pies Postcard, 1½ annas Inland Letter Card, 2 annas Embossed envelope in commercial size, 2 annas square Stamped envelope, 8 annas Aerogramme, 9½ annas Registration envelope, and 14 annas Airmail envelope. 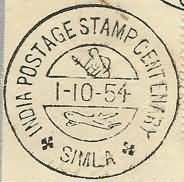 The Airmail envelope sold for 14½ annas contained a sheet of blue letter paper with inscription 'India Postage Stamp Centenary 1854 – 1954' in English printed on top. 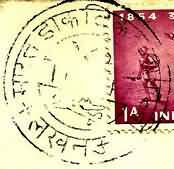 Special Letter Pads containg 16 sheets of white paper with inscription 'India Postage Stamp Centenary 1854 – 1954' in Hindi printed on top were also issued at 4 annas per pad. 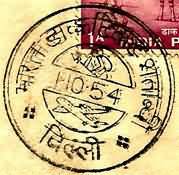 A multicolor First Day Cover priced at 1 anna was released for this issue. 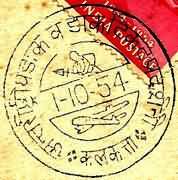 However no brochure was issued on this occasion. 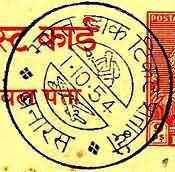 A special First Day of Issue pictorial postmark was provided at 34 post offices across India for this issue. 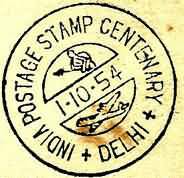 Usually at that time the First Day of Issue postmark was provided at the philatelic bureaus that were 10 in all. 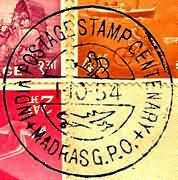 Thus for this issue the First Day of Issue postmark was provided at additional 24 locations. 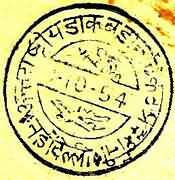 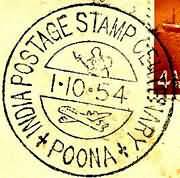 The postmark was inscribed 'India Postage Stamp Centenary' and depicted a postal runner and an aircraft. 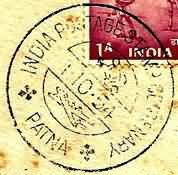 The First Day of Issue postmark with inscription 'International Philatelic & Postal Exhibition' and with same design as that with the inscription 'India Postage Stamp Centenary', was provided at New Delhi as well as at Calcutta. 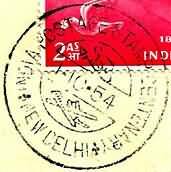 In addition the INDIPEX P O at the India International Philatelic Exhibition at New Delhi also serviced the First Day Covers with its date postmark. 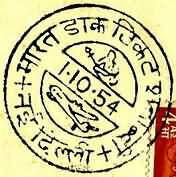 The design of this date postmark, used for duration of the International Philatelic Exhibition, was also same as the First Day of Issue postmark. 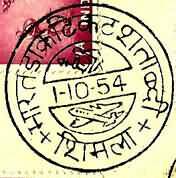 All these postmarks were provided in both the languages English and in Hindi. 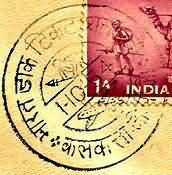 Thus there were 2 postmarks for each location, one in each language. 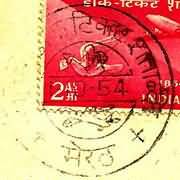 A complete collection of the First Day of Issue postmark of this issue will have 74 different postmarks. 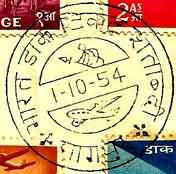 India International Philatelic Exhibition was held at New Delhi. 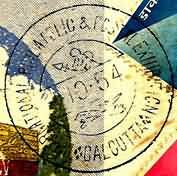 It was the first large scale exhibition in this part of the world with participation from 70 countries. 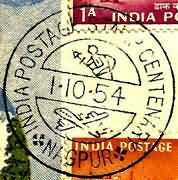 This exhibition was originally scheduled from October 1 to 15 but was extended to October 31, 1954. International Postal Exhibition was also held at New Delhi from October 1 to 31, 1954. 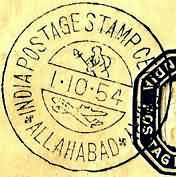 There are several varieties in the design of the postmark but that is matter for another article.